A Canadian photographer has spent 14 years travelling across what used to be the Soviet Union and taking pictures of bus stops which he says are fascinating and under-appreciated moments of creative flight. Christopher Herwig is a Canadian photographer who currently works with the United Nations in Jordan. His images are used by National Geographic, CNN Traveller, Natural History, Lonely Planet and other influential publications. 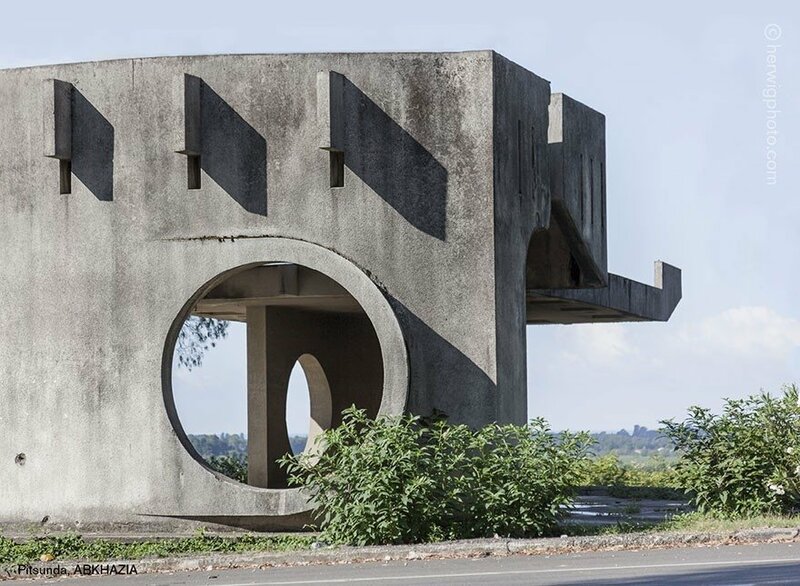 Many in Lithuania know his name because of his 14-year-long project "Soviet Bus Stops". The Canadian says he came up with the idea quite accidentally. In 2002, he was cycling across Lithuania and took a snapshot of a bus stop by the road. He then realized how much beauty, mystique and heritage are contained in these small functionalist edifices. He later spent three years living in Kazakhstan where, working as a photographer, he noticed that there, just like in Lithuania, bus stops were pieces of art and walking between them was not unlike visiting an art gallery. Over the subsequent 14 years, Herwig travel some 50,000 kilometres looking for bus stops in all the post-Soviet countries. This resulted in 15,000 photos of bus stops and a wealth of discoveries. "It was a little bit of a of a game for me, a scavenger hunt. You sometimes can find things you would never expect. And for me it was a great reason to travel. "During these journeys, I went to places I would never travel to without a reason. I'd never just go to Tomsk or Novosibirsk. But I travel there, meet people and find those bus stops I've been looking for. I'm struck with a sense of being an explorer, a discoverer. Sure, you don't discover new things in the world, but this is very exciting," Herwig says. The bus stops captured in his images are very diverse. Some radiate grandeur, brutality or functionalism, others remind of pieces by famous artists and architects or surrealist characters. Most of these bus stops were built between 1960 and 1980, when the Soviet Union was under the stagnant leadership of Leonid Brezhnev. Herwig says he hasn't seen much ideology or propaganda in these pieces of architecture; rather, they reflected each country's culture and tradition. In all of them, the bus stops were similar in their uniqueness, but they seemed to have been adapted to local landscape and customs. "In Estonia, there are a lot of bus stops made of wood and, say, in Armenia the bus stops are massive and brutal. In Ukraine, the bus stops are more embellished, you can see ethnic patterns. Kyrgyz bus stops reflect the lives of local people, their culture and traditions. For instance, one bus stop looks like a traditional Kyrgyz hats that they always wear," the photographer says. When they were built, the bus stops were not seen as important pieces of architecture that anyone had to pay much attention to. Building a bus stop was the first task for many an architecture student. Many saw it as a funny thing to do and make some money. Sure, this niche of creative freedom was used not just by junior designers. For instance, the famous Georgian artist Zurab Tsereteli dotted the region of Abkhasia with exceptional colourful bus stops that are reminiscent of the creations by the Catalan architect Antonio Gaudi. Bus stops shaped like octopi, spaceships, abstract objects decorated with tiny mosaics or drawings referencing the local culture. Herwig says he is most fascinated by exactly this kind of uncensored creativity epitomized by the Soviet-built bus stops. "Young designers were truly more eager to work with small rather than big and important projects - because you had more freedom working on them. Architects could come up with many interesting things. "One architect in Belarus told me that they were quite open to other people's suggestions. For example, there was a construction worker who brought his wife's magazine. It was called, I think, 'Robotnitsa'. There was a tablecloth for stitching and a sample pattern, so he suggested drawing that on the bus stop. Everyone burst out laughing, but why not? They allowed to do it. So they allowed much freedom in creating the bus stops, which is perhaps why I like them so much," Herwig says. Over the 14 years of his travels, he says he's noticed that fewer bus stops remain. 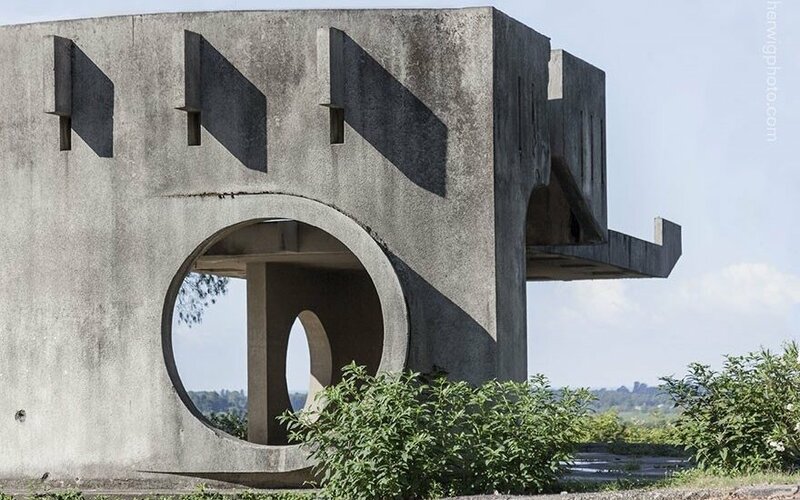 "The beauty and uniqueness I see does not seem to matter to many countries," Herwig adds, saying that one of the reasons he started taking photos of Soviet bus stops is to preserve them on paper if not in reality. "Before, when the stops were new and unique, they were more valued than today. Now many see the stops as something old and neglected, they pile waste behind them. They see them as ugly and not as something that should be preserved and unique. "For me, this project is just about the bus stops. I don't want it to be a political statement about the past or the present. I want people to admire those bus stops as well as people who created them," Herwig says. His photos from the Baltic States and Central Asia have been published in a book titled "Soviet Bus Stops". The photographer intimates that his adventures from the bus stop scavenger hunt in Russia and Crimea will soon be rendered in a documentary film. For the time being, however, Herwig is leaving the Soviet bus stops behind to return to Jordan to dedicate his time to refugees and UN organizations.